The village of South Milford was known as Mysenford in the year 936. The name seems to changed over the years, being recorded as Myleford (1030), Mileforde (1086), Mileford (1154), Mylneforth (1521) and South Myleforth (1526). However all of these variations are of Saxon origin and refer to the ford by the mill, or possibly a ford which was a mile from Sherburn. In early medieval times the road to the south from Sherburn would have been along what is now known as Garden Lane and would have then had to ford Mill Dyke before heading South probably through Lumby and on towards Fairburn. The mill later known as Sherburn Mill was sited up Mill Lane ( the road beside the TPOST cafe) at the point where the Dyke would have been forded. It was a water mill fed by a race from a dam. The last Miller was Mr Atkinson and milling ceased upon his retirement in about 1932. 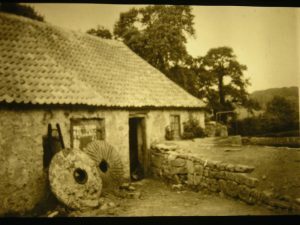 This is believed to be the last known photo of the mill. The village remains a small agricultural settlement until the eighteenth century. After the Norman conquest the land remains under the overlordship (barony) of the Archbishop of York but was held by a number of Norman families. First it was de Laci and then a number of others are mentioned in deeds including De Camera, De la Chambre (Chambers), de Wileby (Willoughby). The manor of Stiveton, which became Steeton Hall, was most likely built by the Reygates around 1360. More information about the hall and its Gateway can be found on the English Heritage website. William de Reygate left a daughter to inherit Steeton in1375. She married William Carell, of Aldwark, and thereafter Steeton seems, with one exception, to have been deserted by it owners. The great-granddaughter of the Reygate heiress brought both Aldwark and Steeton as her dowry to Richard Fitzwilliam. Their grandson was killed at Flodden in 1513, his wife remarried and hence Steeton passed to Sir James Foljambe. During its long tenure by the Foljambes, the only member of the family to live at Steeton was Peter Foljambe who died there in 1668 and was buried in Sherburn church. The first record of Methodists meeting in South Milford was in 1787. In 1814 the first Trust was formed and the site of the chapel, originally two cottages with small orchards, was formally conveyed on High Street. The ‘little chapel’ was opened in 1818 with no organ or pews and in1861 the Sunday School section was added alongside. 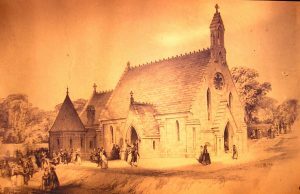 The foundation stone for a new chapel to be built adjacent to the first one was laid on 17th September 1875 and the first service was held on 30th March 1876. The chapel is no longer used and has been sold for conversion to housing in 2019. The Primitive Methodists built their chapel on Westfield Lane in 1841 and after closure in 1870 the building was used as a Dame School, a type of private elementary school usually taught by women, and had its roof steepened. It is now a private house known as Beulah House. St Mary’s Church was consecrated on 25th November 1846. To see an extract from the London Illustrated News click on this link: Church Consecration. The land for the church was given by the University of Oxford with additional land donated by Benjamin Crosland. The costs of about £1500 were covered by sisters Elizabeth and Mary Isabella Gascoigne of Partington Hall who had their own pew in church until 1875. The parish was separated from Sherburn in 1859 and the first entry in the parish records was made on the 1st December 1860.